This hotel offers impressive natural areas, an amazing golf course, pools, restaurants, bars and much more. The 630 rooms of this hotel are exquisite and luxurious, under the Don Pablo Collection seal, and are located near the sea. 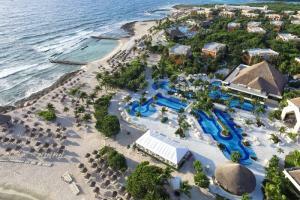 Located about one hour away from Cancun International Airport. Riviera Restaurant - International cuisine buffet, Gourmet Arlequin Restaurant - Experimental cuisine, Dolce Vita Restaurant - Italian cuisine, Frutos del Mar Seafood Restaurant - Buffet style dishes and an extensive menu of seafood cuisine. Akumal Beach, Cenote Aktun Chen, Akumal Dive Center.